Everyone is a writer. Yes, even those of you who think you don’t like writing, who don’t journal or blog, who’ve never written a book or dreamed of writing the next Great Novel. Everyone is a writer, because we’re all writing the story of our lives–if not with pen on paper or at the computer, then with our smiles, tears, and everyday living, in the appointments jotted down on the family calendar, the bills we pay each month, the grocery lists scribbled on the back of old envelopes or entered on our phones, the photos we Instagram, and the many more pictures and mental lists we keep in our heads. All of us are writing our life story all of the time. So when I shared my top 23 lessons about writing with the Fraser Valley Christian Writers, I realized that in most cases wherever I said “writing,” I could substitute “life,” and the writing lesson worked just as well as a life lesson too. Writing is an act of faith, not of grammar.– E.B. White. As an act of faith, writing means imagination and risk, a journey without always knowing the destination or the way. See my earlier post on Writing and Other Acts of Faith. Better to write for yourself and have no public, than to write for the public and have no self.– Cyril Connolly. Unless you’re writing advertising copy, writing isn’t about pleasing other people. At its best, writing expresses something genuine about yourself. Personal journal writing is foundational to my other writing. I journal to think things through, to pray things through, but I also find that an article or book idea most often starts in my handwritten journal. My Sacred Pauses: Spiritual Practices for Personal Renewal began as a personal reflection in my journal. Reading is foundational to writing. Read in your genre. Read outside of your genre. Read for information, read for ideas, read for research. Good writers are good readers. Writing takes time. “A writer never finds the time to write. A writer makes it.” – Nora Roberts. I can’t say I write absolutely every day as some do, but I make time for writing most days. Writing takes discipline. To develop a habit of writing, to meet deadlines whether self-imposed or set by a publisher. “If you wait for inspiration to write, you’re not a writer, you’re a waiter.” – Dan Poynter. Writing means re-writing. Sometimes someone will say to me, ”oh I wish I could write, but I’m not like you, my words don’t just flow.” The truth is my words don’t “just flow” either. It’s amazing how much re-writing it takes for words to flow! Writing takes perseverance.When I first submitted my proposal for Where Two Are Gathered: Readings for Shared Devotions, my potential publisher said they’d like to see the manuscript once it was finished. But when it was finished, they declined to publish since “its novelty is its risk.” I went on to submit the manuscript 8 more times before finally finding a publisher!. Writing is fun. Writing is not all discipline, re-writing, and perseverance. Writing means playing with words, playing with ideas, the joy of communicating and having someone else actually get it. Writing means waiting. It’s not all about getting things done. Writing also needs space for waiting–for the right time, to allow ideas to gel, to hear back from an agent or publisher. Writing is a great way to learn and grow. I never realized there were so many unnamed women in the Bible until I researched and wrote Remember Lot’s Wife and Other Unnamed Women of the Bible. With each of my books, I’ve learned even more than I’ve been able to write. Writing can be lonely, so it’s important to have companions on the way, like a writers’ group, or family or friends who can encourage you. If a friend hadn’t recommended me as a writer for CSS Publishing, I would never have written and published Ordinary Time with Jesus. Don’t compare yourself to other writers. When I fall into the trap of comparing, I wonder, why write at all? I should just keep reading instead! After all, I’m never going to be a Barbara Brown Taylor or Maya Angelou. But so what? Some of my readers have never read those other authors, but they read my writing. I have a unique voice and audience, and so do you. No one can say what you can say. No one can have the audience that you can have. Don’t let perfectionism stop you. “If I waited for perfection, I would never write.” – Margaret Atwood. Allow others to inspire and encourage you. As you can tell from this list, I love a good quotation. That’s one reason I joined Pinterest, to have a place to save encouraging quotes about writing that you’re welcome to follow. Writing and publishing are two different things. Publishing doesn’t make a writer. A writer writes. Traditional publishing is not the only option. My books have been published with traditional publishers that take care of editing, layout, copyright registration, distribution, and a host of other details. But I’ve also produced the Sacred Pauses Group Leader’s Guide and Scripture Index as a short e-book, and maintain a Pinterest board on Hybrid Publishing with resources on both traditional and self-publishing. You can also publish in online magazines or blogs, or start your own website. Whatever form of publishing you pursue, be willing to promote your work. At various times, my publisher(s) have placed ads, sent emails, held book giveaways, shown my books at conferences, and promoted my published work in other ways. I’ve also held book launches, gone to conferences and other events, led retreats, participated in blog tours, and shared my book on social media. Keep learning—about writing, publishing, promotion, etc. For me the big learning curve over the last couple of years has been social media. Start your own website. I started with a free website on WordPress.com, and remain a huge WordPress fan! I think of this website as a creative space apart from my regular pastoral ministry, and the hub of my social media presence. Be selectively social. With so many different social networks, I find it impossible to be engaged and effective on all of them. For now, I focus on my own website, email list, Twitter, Facebook, and LinkedIn. I’ve made some new friends that way, gotten some writing assignments, sold some books, and enjoyed myself along the way. Live your life. I take a weekly Facebook and Twitter Sabbath to remind myself not to get over-absorbed in living online. I love writing and social media (maybe some days a little too much! ), but I love my life offline even more. Writing is a journey, not a destination. So when I’m journaling, filling one blank book and starting a new one is not a destination. Completing a sermon or publishing a book is not a destination. It’s not like I’ve arrived. These are simply way stations–places to pause, to rest, to take in the view, before carrying on. I`m at a way station now with the publication of Spark: Igniting Your God-Given Creativity, but I`m just about ready to move on with a new project–more on that later! 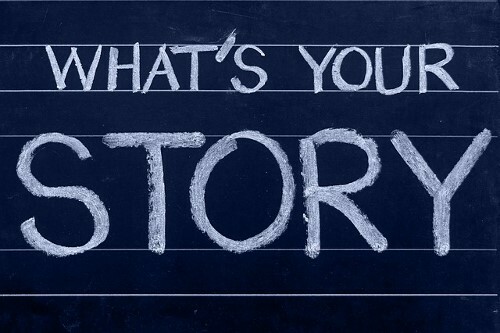 Your Turn: What’s your story? Do you have a writing/life lesson to share? Thank you for these grace-filled lessons. I need a good reminder for even the ones I know already! #16 especially encourages me right now, as I tell myself that I write because I love the process, not because others love what I produce. I suppose #5 and #6 address it, but my biggest struggle is resisting distraction. I am only consistent about personal journaling, and need to find ways to expand what I start there. A good list, good food for thought! Thank you for your comment and affirmation–and, oh yes, I find distractions a challenge too. I find it can help to explore the reasons behind the distraction. For example, sometimes I’m distracted from a piece of writing by other thoughts, and that’s often a clue that I need to change the direction of my writing. Other times, a distraction is simply a distraction that I need to set aside–sometimes I tell myself I’ll set aside that distraction for 15 minutes, and if my writing momentum hasn’t taken over by then and the dishes in the kitchen sink or whatever are still calling out to me, then I’ll deal with them. Have you developed some helpful strategies in your struggle with distraction? I use a timer, too, to limit the time I work on a particular project or goof off. My husband can always tell you what time it is without a watch, accurate within 5-10 minutes. I am the opposite and have a terrible sense of time passing, so the timer helps me a lot. Deadlines are my friend, so I set weekly deadlines for blog posts, chapter reviews, etc. Can you tell how many ways I have to compensate for my innate scatteredness?? Those are great ideas – I hadn’t thought about designating specific tasks on specific days, but I think I’ll try that now too. Thanks for the tip! Great list! Number two is clearly my favourite. I was at a workshop once where we were reminded that much of the seemingly mundane writing of our day to day existence is still writing. This has impacted me in an interesting way. When attentive to the task, simple email etc become opportunities to work on the craft. I think email sometimes gets dismissed as a chore vs. writing as creating, but you make an excellent point that email is still a form of writing and presents an opportunity to work on the craft. I’ll remember that the next time I feel as if I’m getting bogged down with email! April, thank you for this good word!. Other members of our Christian Poets & Writers group on Facebook will surely welcome your post, so I’ll highlight it on the Christian Poets & Writers blog – http://www.christianpoetsandwriters.com. God bless you and your writing life in Christ. Thank you, Mary, I appreciate your highlighting my post and enabling me to participate in the life of the group this way. Blessings to you as well as you continue to write and encourage other Christian poets and writers. Received from a reader via email: Even though I do not like writing, I take courage from your many helpful pointers in writing. I like #2) Better to write and have no public than …. #7) Writing means rewriting, and #11) Writing IS a great way to learn & grow. Your comment reminds me of a friend who says he “hates” journaling but continues to do so since he finds it so valuable in his personal life. We may not always “like” writing, but it’s a basic skill that allows us to communicate with other people, to share who we are, to explore and express new ideas. I’m glad you found this article helpful even though you don’t particularly like writing, and because of that, I especially appreciate your taking the trouble to write a comment in the form of an email. Thank you!